In the world of fantasy football, value is heavily weighted toward players on the best offenses. We’re not breaking any ground here, but fantasy success is predominantly dependent on touchdowns, and the best offenses score the most. Despite knowing this, we miss on breakout offenses every year. For the Kansas City Chiefs in 2018, Kareem Hunt was a back-end first-round pick, Tyreek Hill was drafted in the second tier of wide receiver, Travis Kelce was almost never picked in the first few rounds, and Patrick Mahomes was a mid- to late-round draft pick. They all outperformed their ADP on a per-game basis. For the Los Angeles Rams in 2017, Todd Gurley was drafted as a volume-based back-end RB1, the Rams wide receiver trio was mostly avoided, and Jared Goff went largely undrafted. Once again, they all outperformed their ADP. Today, we’ll look back to figure out what we missed while undervaluing a wide variety of players at multiple positions. Then, based on what we learned, we’ll make a prediction on who the next breakout offense is for the 2019 fantasy football season. Both the Chiefs’ (Mahomes) and Rams’ (Goff) offensive breakouts are similar in that they both featured former first-round draft picks at quarterback entering their second season. Both players took a massive jump individually in their careers. If you extend this to the 2018 Chicago Bears — a mini-breakout if you will — the trend continues. While Mahomes only started one game in 2017, he had a major head start on learning Kansas City’s offensive scheme. The Chiefs and Rams offenses both feature two of the NFL’s best offensive play-callers. Although the Chiefs and Rams run very different offensive schemes, in each of their breakout seasons, the concepts they were running caught opposing defenses off guard. This caught up at times to the Rams in 2018, in addition to key injuries at the skill positions, but both breakouts featured each respective play-caller at the top of their game with a near-perfect design for their specific personnel. 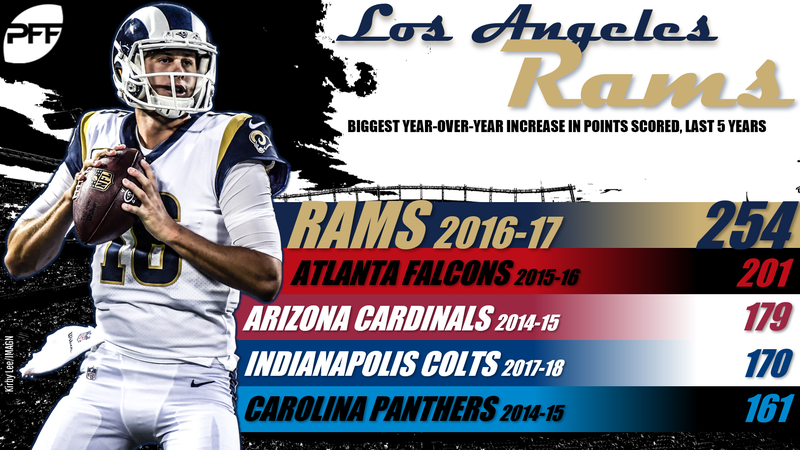 In 2017, the Rams finished the regular season with PFF’s No. 6 overall offensive line grade. The Chiefs finished the 2018 regular season No. 13 overall offensive line, but they graded out in the top-10 before suffering midseason injuries to multiple starters on the interior. Neither team performed anywhere near even the bottom-third of the NFL in overall offensive line play for any tangible stretch of games and this played a key role in helping these offenses stay hot. The importance of a run game and the running back position is a debate for another piece, but it’s hard to ignore the foundation both the Rams and Chiefs at the position. In 2017, Gurley broke out as the best dual-threat fantasy running back and top scorer overall. In 2018, Hunt took that role, as touchdown regression from 2017 worked in his favor in line with Kansas City’s breakout overall. Hunt did not finish the season, but the Chiefs offense was at its peak when he was in the starting lineup. The Browns check off a lot of boxes here. 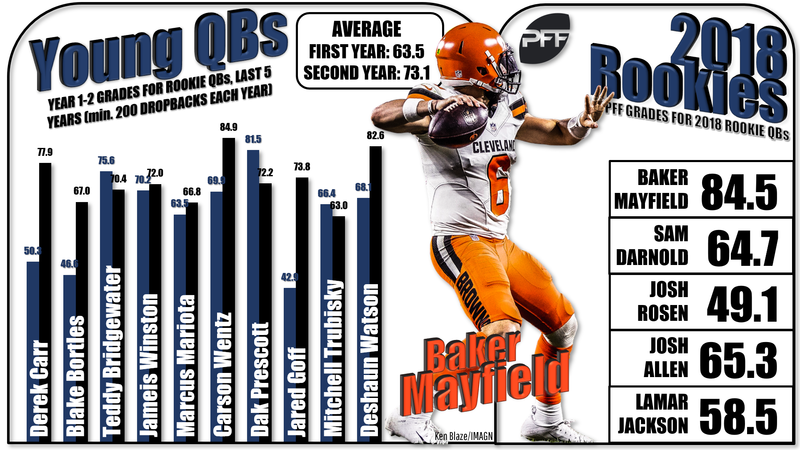 Baker Mayfield entered his rookie season as PFF’s highest-graded quarterback prospect and the No. 1 overall player on the big board. He did not disappoint as a rookie and his stats improved across the board once Freddie Kitchens took over as the play-caller. Kitchens will return in 2019 and the Browns may have lucked (let’s be honest about what happened) their way into a franchise left tackle by taking a chance on Greg Robinson last offseason. Robinson just signed to return in 2019 to an offensive line that finished the 2018 season ranked No. 2 overall. Nick Chubb will enter year two as the only rookie to rival Saquon Barkley in forced missed tackles and it’s safe to call him a foundational back. The Browns don’t exactly dominant receiving options, but they do have nearly $81 million in salary cap space, per OverTheCap, and fewer roster holes to fill elsewhere than you would expect. The 49ers don’t technically check off the second-year quarterback box, but Jimmy Garoppolo has only had 10 career starts. It’s easy to be confident about Garoppolo and even more confident about play-caller Kyle Shanahan, who has moved the football with just about every quarterback he has coached. The 49ers had an average offensive line (No. 15) in 2018, but it could certainly improve if second-year offensive tackle Mike McGlinchey reaches another level in 2019. The foundation back is up for debate with Jerick McKinnon and Matt Brieda performing well in spurts, and the receiving game options need help, but they are another team flush with excellent draft capital and approximately $69 million in salary cap space. Some people have already made their minds up on Lamar Jackson as a passer, but I think they’re underrating what a brand-new offensive scheme tailored around his strengths could mean. Ravens offensive coordinator Greg Roman plans to do just that — start the scheme from scratch. The last time we saw him do this in San Francisco, he made Colin Kaepernick look like an All-Pro for a stretch of his career. The Ravens are a model of consistency when it comes to offensive line play — No. 10 in 2018. However, they do lack receiving game weapons and a foundation in the run game. After taking a $16 million dead cap hit for trading Joe Flacco, they aren’t exactly flush with cap space to help fill out the offense we’re looking for. Those who have been playing fantasy football long enough understand the impact Bruce Arians-led offenses have on the fantasy landscape. Arians made Carson Palmer a favorite value for managers using the strategy of waiting to draft a quarterback for sure. Arians attacks defenses vertically and Jameis Winston is the right fit for his philosophy. Unfortunately, the Buccaneers can’t be counted on to have a foundational piece at running back in 2019 and we’re not sold yet on an offensive line that ranked No. 20 overall. If the line improves, the Buccaneers have the receiving options to bring this fantasy offense to life. Tha’s a big if. Deshaun Watson and DeAndre Hopkins. That’s the strength of any case for the Texans. When you step anywhere beyond that, things get murky. Bill O’Brien ran the ball on first down in the first halves of games more than any other team in the NFL, according to Warren Sharp. Move on to the offensive line and it gets even uglier. The Texans finished 2018 ranked No. 23 and they still haven’t found out one let alone two starting-caliber offensive tackles. They also don’t have a foundation back. The Texans breakout campaign is a tough sell. Sam Darnold is a second-year quarterback who inspires confidence and you can even make the case that play-caller Adam Gase does as well given the success he’s had relative to the quarterbacks he coached in Miami. As we move through the rest of the roster, that confidence fades. Their offensive line is devoid of young talent that may improve and finished 2018 ranked No. 25. That’s probably a non-negotiable factor preventing a breakout. In addition, the Jets don’t have a foundation at running back, wide receiver, or tight end. They have a few role players at each, but no one that breaks the game open. What they do have is approximately $104 million in salary cap space. We turn to a team with another second-year quarterback who was drafted in the first round, but not much else. Kliff Kingsbury has a reputation as an innovative play-caller, but he did just get fired for not finding enough success in the Big 12 during a run that included him having Mahomes as his quarterback. The Cardinals have a foundational piece at running back in David Johnson, but it doesn’t make up for the dire state of their offensive line. Arizona’s offensive line finished 2018 ranked No. 32 and it will be difficult to dig out of that ditch. The Bills have a second-year quarterback who fits the first-round billing in Josh Allen, but he finished No. 28 of 30 qualified quarterbacks in PFF grading. The Bills aren’t much better than the Cardinals on the offensive line — the unit finished 2018 ranked No. 26. The Bills have an aging foundational back in LeSean McCoy, but they also have the worst receiving options of any team in this piece. They’re also too far away. The Browns are our pick to break out in 2019 with the perfect blend of similarities to the breakout teams of the past two seasons. We can draft Mayfield, Chubb, Jarvis Landry, and David Njoku slightly above ADP and the expectation is the Brown could find another outside wide receiver due to benefit should Cleveland meet their potential. We also wouldn’t be surprised if the 49ers join them.